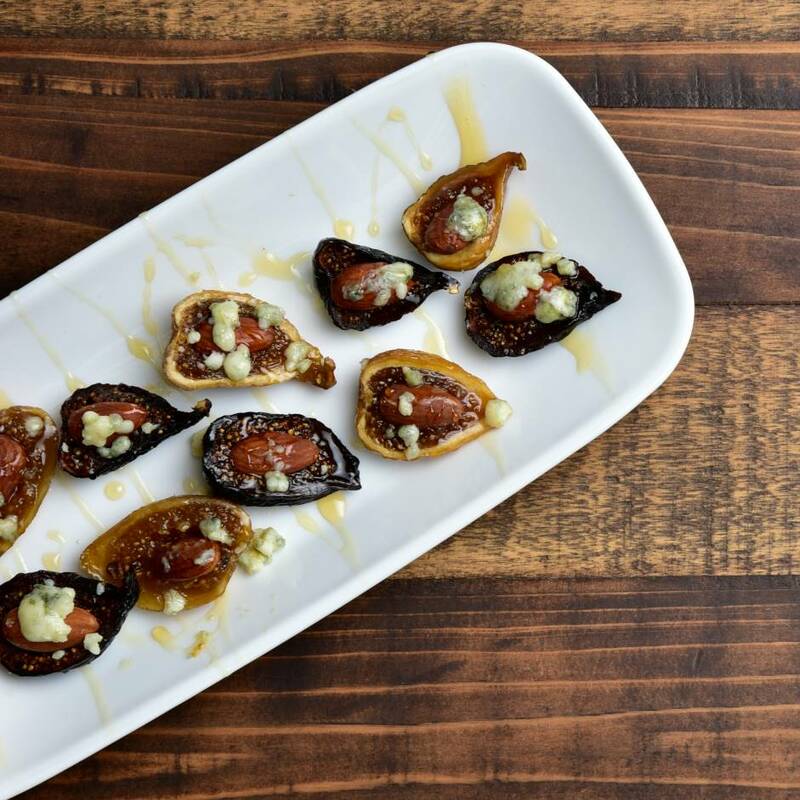 Take your favorite dried fig and cut in half length wise. Stuff with pecan half or almond. Place in oven at 350 degrees for 10 minutes until cheese is melted and golden brown. Remove from oven and drizzle with honey. Finish with a sprinkle of salt and fresh ground pepper. 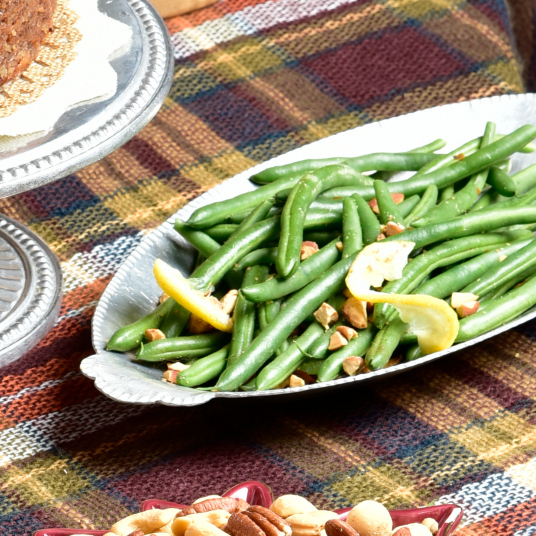 *topping variations can include crispy, chopped bacon, dash of cayenne, or you can always substitute a delicious Pecan Half instead of the almonds, yum! 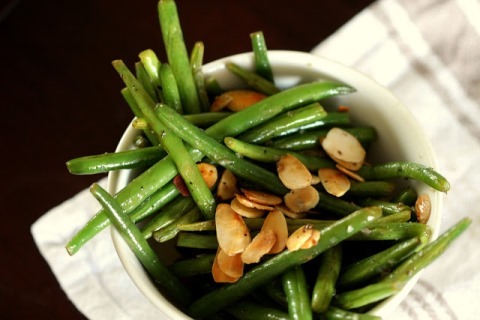 Place the green beans in a large bowl and drizzle with olive oil. Stir to coat, making sure oil is evenly distributed on the beans. Sprinkle with salt and pepper. In large skillet, melt butter. 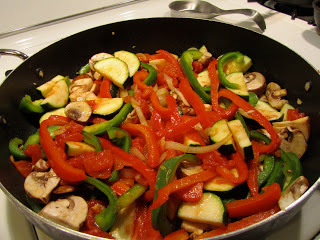 Sauté zucchini, peppers and garlic until tender-crisp, stirring occasionally. Sauté 10 minutes or until all vegetables are tender, tossing well. Before serving mix in nuts. Serve hot. Serves 6. Steam spinach for a minute or two until wilted. Drain in a colander; press out water. Chop spinach coarsely. Pour olive oil into a heavy pot, add garlic and stir 2 - 3 minutes over medium heat. Add raisins and almonds, and cook two minutes. Add spinach and pepper. Spoon into hollowed-out tomatoes. 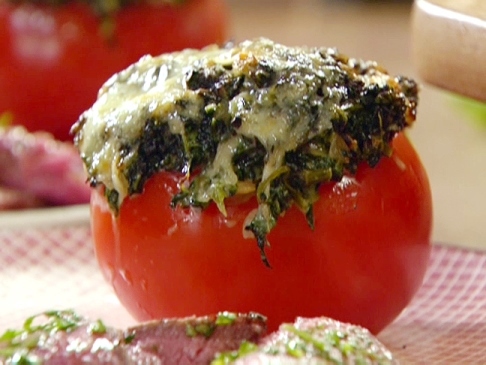 Sprinkle with cheese, and brown lightly under broiler or in oven. Serves 4 to 6. Combine brown sugar, cashews, salt and ginger. 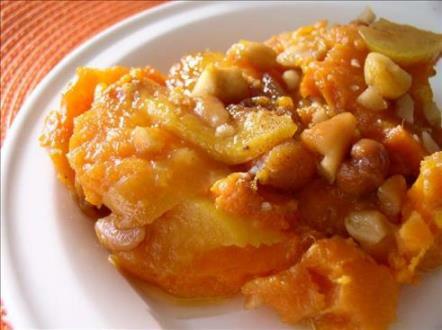 In 10’’ x 6’’ x 2’’ baking dish layer half the sweet potatoes, half the peach slices; sprinkle with half the brown sugar and cashew mixture. Dot each layer with butter or margarine. Bake, covered, in 350° oven for 30 minutes. Uncover and bake about 10 minutes more. Heat peach syrup and spoon over potatoes before serving. Yield: 6 to 8 servings. Peel sweet potatoes and cut into slices. Mix apples and potatoes with brown sugar. Combine oat bran, oatmeal and cinnamon. Cut butter into oat bran mix until mixture is crumbly. Add pecans and mix well. 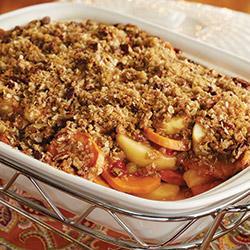 Pour apples and potatoes into a greased baking dish. Sprinkle crumbly pecan mixture on top. Bake at 350° for 45 minutes or until potatoes are tender. Serves 4 - 6. 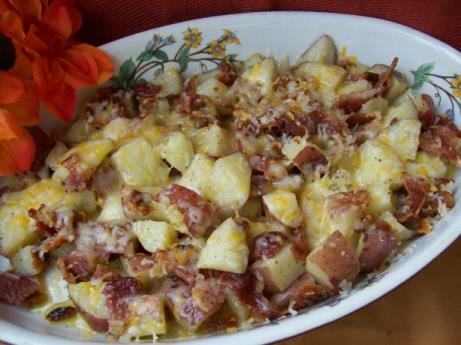 Toss potatoes with cheese, mayonnaise, green onions and seasonings. Turn into a buttered 13’’ x 9’’ baking dish. Combine bacon and pecans; spread over potato mixture. Bake at 325° for 30 minutes or until thoroughly heated. Serve warm. Yield: 8 to 10 servings. Cook broccoli in boiling water; drain. Set aside. 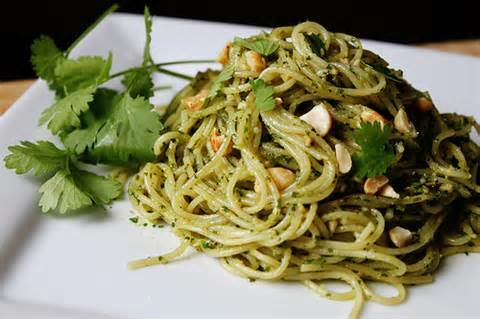 Cook pasta in boiling water; drain, reserving 1/2 cup water. Set aside. Meanwhile, in a large skillet sauté the shallots in olive oil over moder-ately low heat until transparent, about 5 minutes. Add garlic, bell pepper; cook until tender. Add snow peas; sauté 3 or 4 minutes until tender. 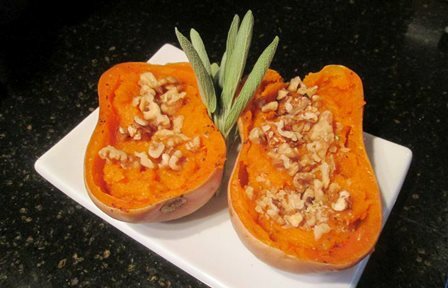 Blend Parmesan cheese and walnuts in a food processor; add to skillet. 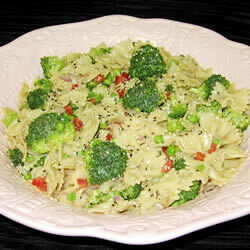 Add broccoli, parsley, 1/2 cup of pasta water. Stir in the sherry and return to a boil. Pour over pasta and serve. Sauté garlic and onion in oil until onion is tender. Toss together; heat 2 minutes. Toss with Parmesan cheese. Yield: 4 to 6 servings. Precook manicotti in boiling water until partially softened (about 5 min. ); drain. 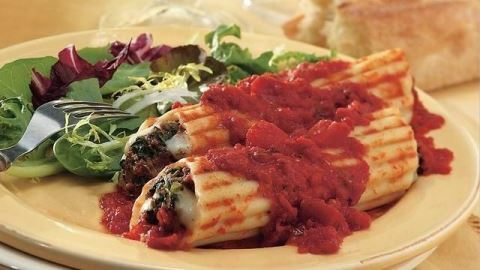 Mix hazelnuts, spinach, cottage cheese, onion, seasonings and eggs; fill manicotti. Cover bottom of a 2 quart baking dish with one cup spaghetti sauce. Arrange filled manicotti in a single layer in baking dish. Allow space between each for expansion during cooking. Cover dish and bake at 375° for 40 to 45 minutes. Yield: 6 to 8 servings. In a heavy saucepan, bring to boil enough water to cover beans. Add beans and salt to taste and boil for 5 to 7 minutes, until they lose their crunch. Drain and toss with 3 Tbsp. butter. While beans are cooking, melt remaining Tbsp. of butter in small saucepan; add almonds. Sauté, stirring constantly, until almonds are just golden. Watch carefully to keep from burning. Toss with green beans. Serve while hot. Yield: 8 servings. Preheat oven to 350°. Place squash, cut side down, in 13” x 9” x 2” glass baking dish. Pour water over squash. Bake until skin on squash is blistered and brown and flesh is tender, about 1 hour and 15 minutes. Turn squash cut side up. Cool slightly. Scoop out flesh and transfer to medium bowl, leaving 1/3’’ shell. Mash flesh. Add butter and stir until melted. Season to taste with salt and pepper. Spoon squash back into shells. Sprinkle with chopped walnuts and serve. Yield: 4 servings. Peel and dice eggplant; cook until tender. Drain and mash. Stir in other ingredients. Pour into a buttered baking dish; bake in 375° oven until brown. Serves 4. Preheat wok or skillet to medium high or 325°. Snap off tough ends of asparagus. Cut asparagus into 2 inch pieces. Pour oils around top of a preheated wok or skillet for 2 minutes. Add ginger, stir-fry for 30 seconds. 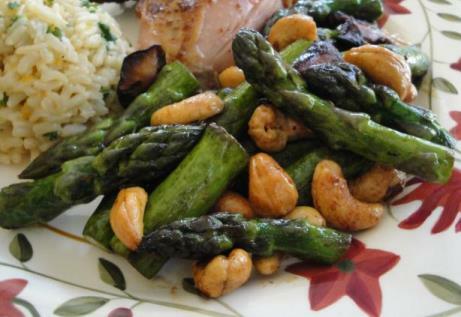 Add asparagus, and stir fry for 2 minutes. Add mushrooms, and stir fry 5 minutes or until asparagus is crisp-tender. Add cashews and soy sauce; toss gently.